Have you ever had questions about a confounding foreign language, but were afraid ask? If you’re looking for answers to those questions -- and a whole lot more -- the PTA’s Intercultural Group is for you. Have you ever wondered what exactly “que sopa” means? Have you ever felt lonely in a new country? Every Tuesday, a group of ISP parents from around the world gather to practice their English and Spanish skills -- and learn about our host country. The group offers a safe space for parents to wrangle with a new language, whether that’s English or Spanish. With native speakers of both languages on hand, everyone from novices to the profoundly fluent can learn some new linguistic trick or colloquialism -- and share hilarious stories of adventure (and misadventure) with their peers. But it’s about more than just language practice. 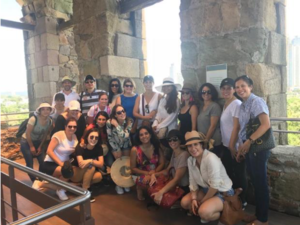 The group also explores Panama’s culture and history. This past October, more than 30 members toured Panama Viejo, shepherded by an expert guide. More recently, a troupe of world-class Panamanian musicians and dancers put on a concert and class for the group. Members learned traditional Panamanian dances from some of the top performers in the country. For recent arrivals to Panama, it’s also a great way to meet new friends and families. Members hail from countries across the world, from Korea to the US to Bolivia and more, and there’s a chance to meet someone new at every meeting. Fast friendships have formed out of the group, and families have connected across the gap of new languages and different customs. The group is a great source of support for new parents in other ways, too. Over the course of two meetings this first semester of school, school counselors have led group discussions about the challenges -- and joys -- of moving a family to a new country. Members shared heartaches and triumphs, as well as their best strategies for finding a new home and new friends in Panama. Parents, along with the school counselors, also talked about the best ways to get kids adapted and help children find their own way through a new country and new languages. As an international school, one of ISP’s great strengths is its diversity. And the Intercultural Group, much like the school itself, draws from the best of that diversity to bring together new friends, teach new languages and grow our school community.